So you might have seen all of this in the blogs already. If not here are some links. This is awesome of course. The A-series even comes with an all new A0 introduction adventure. Unearthed Arcana. For me nothing draws a cleaner line between the "Generation 1" old-schoolers and the "Generation 2" old-schoolers than their opinions on Unearthed Arcana. Generation 1 hates it. Generation 2 loves it. 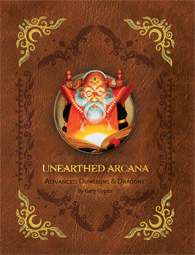 I loved Unearthed Arcana. Not just because it gave me new classes and spells but it meant that this wonderful game I had been playing will continue to grow. So yeah I loved the goofy Barbarian and Cavalier. I didn't care that the Paladin I had been playing all this time now suddenly was changed, I thought it was great. I like how this new version looks. I will agree though with the Generation 1 old-schoolers on one point. The original UA had terrible binding. This one can only be an improvement and I understand that it includes all the errata. The A Series is an odd one for me. I never sought out to collect it, never really considered it much back in the day except when going through it and my new Assassin character was killed. It is also the one I am looking forward to the most. For starters it will be perfect for my kids new AD&D game. Secondly and the most important is it will include the first new AD&D adventure to be published by WotC since they took over TSR. They are supporting an edition other the current version. I don't care how jaded you are this is a big deal. Yes, of course it is about making money. It is ALWAYS about making money, but they are doing it in a way that supports old-school gaming. The S Series was one of my favorite series of modules. I have many copies of the original adventures and even some I have for all 4 editions of D&D/AD&D. I even have the softcover "Super module" they released years ago. I went and had it bound into a hard cover. So while I am happy about this one, I am less excited about getting it. I bet I still will though. My kids have already gone though half of the S modules though. Again I will say if you are an "OSR" publisher I would be getting your A game ready. We seem to be in an odd lame-duck period between 4e and 5e. Maybe WotC (who has nothing else so far on their calendar) is going to fill this with 1e products.